The United States Department of Education has proposed its funding priorities and selection criteria for the $650 million Investing in Innovation Fund, also known as i3, a program that was introduced as part of the American Recovery and Reinvestment Act. The competitive grant program is open to individual school districts, cooperatives, and non-profit organizations in partnership with schools. The program is designed to encourage and reward innovations in education that close achievement gaps, improve proficiency levels, improve graduation rates, or work to recruit and retain "high-quality teachers and principals." Scale-up grants, up to $50 million per grant, for programs that have already proved effective and have had large effect sizes, with adequate evidence to support any claims of effectiveness. Competitive preference: Innovations that serve schools in rural [local education agencies]. Additionally, according to the draft document, "Projects funded under each of the three types of grants would provide services to high-need students and would focus on priorities directly tied to the reform areas of the ARRA; applicants could also choose to meet the additional priority areas. Among the three grant types, there would be differences in terms of the evidence that an applicant would be required to submit in support of its proposed project; the expectations for scaling up successful projects during or after the grant period, either directly or through partners; and the funding that a successful applicant would receive." Applicants will also be required to match federal funds with private dollars and show how their programs will be sustainable when the federal grant money runs out. 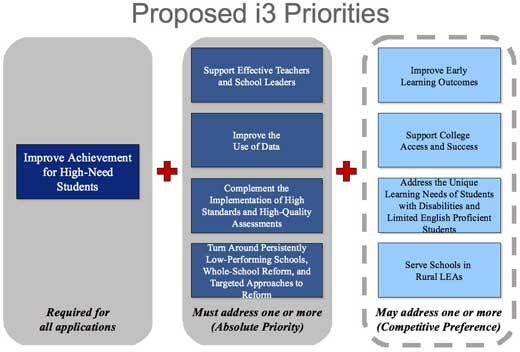 From the Department of Education's i3 proposal presentation, available for download in .ppt format here. "We're making an unprecedented investment in cutting-edge ideas that will produce the next generation of school reforms," said Arne Duncan, secretary of education, in a statement released by the Education Department today. "The i3 competition will provide seed money for fresh ideas, help grow promising programs with a good track record and scale up programs with proven results to a national level. The $650 million Investing in Innovation competition that we are unveiling today is a challenge to school districts and nonprofits. We're looking to drive reform, reward excellence and dramatically improve our nation's schools. Through ARRA, we've been able to avert an education recession and save thousands of jobs in schools across the country. But we also need to invest in the next generation of school reforms and educate our way to a better economy." Public comments on the proposed priorities will be heard for 30 days, and ED said it intends to publish applications in early 2010 and begin accepting applications in the spring. All funds through the program are expected to be disbursed by September 2010. The complete proposed priorities draft can be downloaded in PDF form here. A PowerPoint presentation detailing other aspects of the grant process can be downloaded here. Further details on the Investing in Innovation Fund can be found on ED's site here.